Dewey Goes Pink organizers (top row) Adam Howard, left, and Steve ‘Monty’ Montgomery, right, present the funds raised at the event to, bottom row, from left, Delaware Breast Cancer Coalition Executive Director Vicky Cooke, volunteer Peggy Dever and survivorship specialist Meredith L. Rothstein. 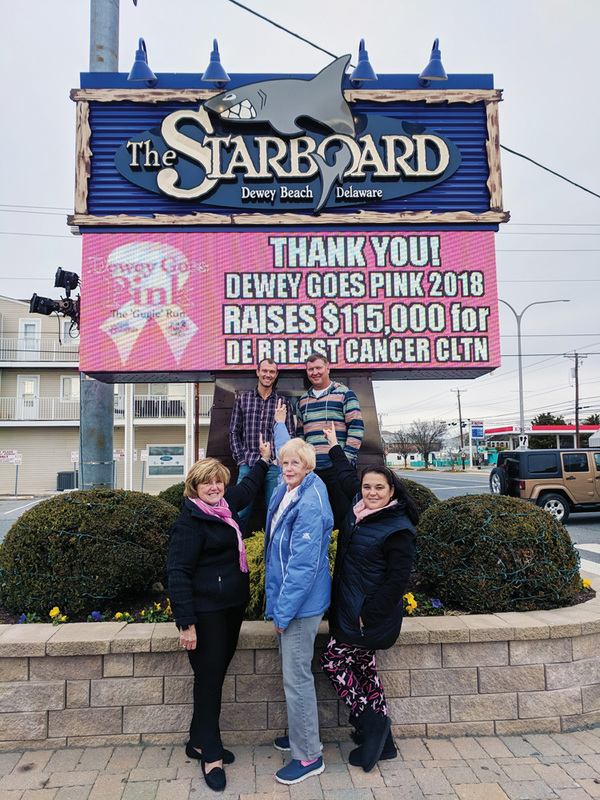 “The Delaware Breast Cancer Coalition would like to thank Steve ‘Monty’ Montgomery and Adam Howard, as well as the local community who truly make this event such a great success,” representatives of the group said. The money raised will fund programs at the nonprofit agency that depend on local support. Several of the programs in Sussex County that benefit from this campaign include financial assistance, community outreach and education, prosthetics, and support for those newly diagnosed or actively fighting breast cancer. Dewey Goes Pink is a 5K race (or 1.5-mile walk) created by two friends Montgomery and Howard in memory and in honor of their mothers. Montgomery lost his mother, Barbara “Gugie” Montgomery years ago, after a 25-year fight with breast cancer. Howard’s mom is currently a breast cancer survivor. Montgomery’s mother had worked to help raise funds through Rehoboth Beach Country Club for the Susan G. Komen foundation but advised him to keep his efforts local just a few short months before her passing. He said she was always impressed with the Delaware Breast Cancer Coalition and how they kept their funds within the local community, helping people in Delaware. Following the loss of his mother, Montgomery connected with Howard, whose own mother continues her battle with breast cancer. The two decided to channel their grief and frustration into Dewey Goes Pink. Since then, the event has raised more than $400,000 for the Delaware Breast Cancer Coalition. Headquartered in Wilmington, with offices in Kent and Sussex counties, the Delaware Breast Cancer Coalition’s programs are designed to reach diverse communities to deliver messages that address their unique concerns about breast cancer and early detection. Recognizing the barriers of language, culture and economics, DBCC trains community advocates through their Peer Mentor Program, as well as workins to help educate and encourage women and men to take responsibility for their health through breast health presentations and community health fairs. In addition, the Delaware Breast Cancer Coalition helps those who are under-served and under-insured to receive free or reduced-cost care. The vision of the agency is to create a community where every person diagnosed with breast cancer becomes a survivor, and fear and doubt are replaced with knowledge and hope.